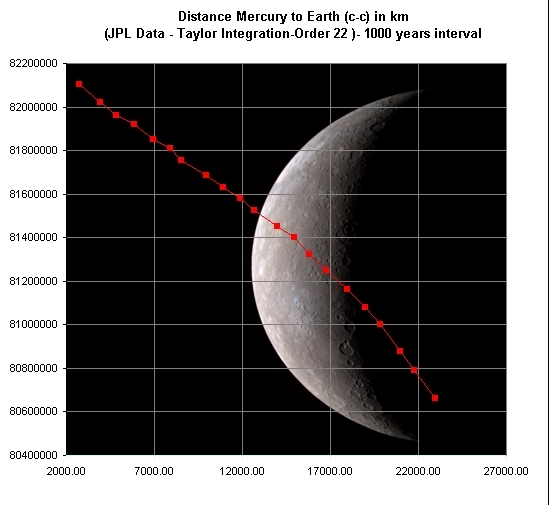 Can GravSim generate a plot of the distance of Mercury from Earth over say a 50,000 year period? This would hopefully help illustrate some concepts. Difficult question to plot a graph for this time period autmatically ! I guess JPL ends at 2200. I gave it a try using the Taylor integrator ( Picard) . After some manipilation with Excel I got the following graph for the next 1000 years . The output was split in timeframes of 10 years starting at 1 feb 2007 . The minimum value of each 10 year period ( if smaller then before ) is represented in the graph . So the next close approach in the coming 10 years will be 31th may 2015 . It's nice to see how the close approaches seem to gather each time beginnig of june . This is a really tricky task Kevin . It requires a very good accurancy to perform this . Not only the orbits should be integrated very accurate in terms of orbital elements , but also the true anomaly should be very precise for both bodies . If this isn't the case the close approaches will miss. I've been to quick to run the above graph , as I noticed that runnig it at a higher accurancy the results vary a little . The graph herunder was run at an accurancy 10 times higher than the one above . Contrary to the Solex integration which was mentionned above the minimum distance keeps decreasing after 2679 . I think its hard to be confident about results after more than a couple of hundred years ( lets say thousand year ) given the accumulating errors . Ahh. This is why I like multiple sources. The Solex 10 comment on the Mercury article had a few typos. The comment has been changed to say, "After much longer gaps, the next approach to within 82.1 Gm is in 2679, and to 82 Gm in 4487. 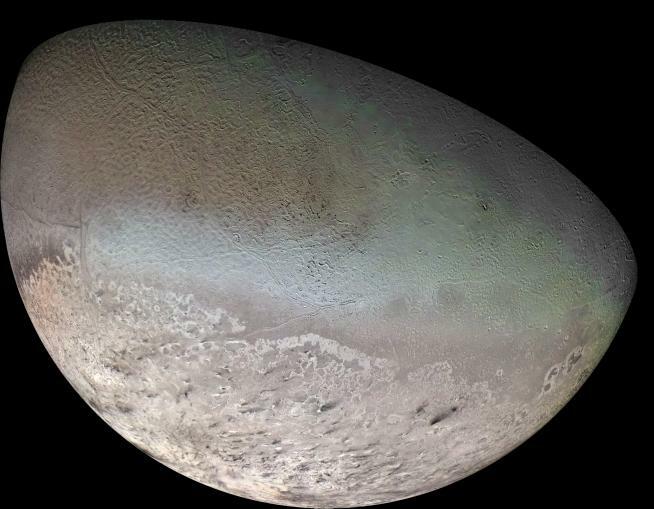 But it will not be closer to Earth than 80 Gm until 28,622." 1. the prediction of the motions of Mercury was an important factor in the early acceptance of Einstein's General Theory of Relativity. 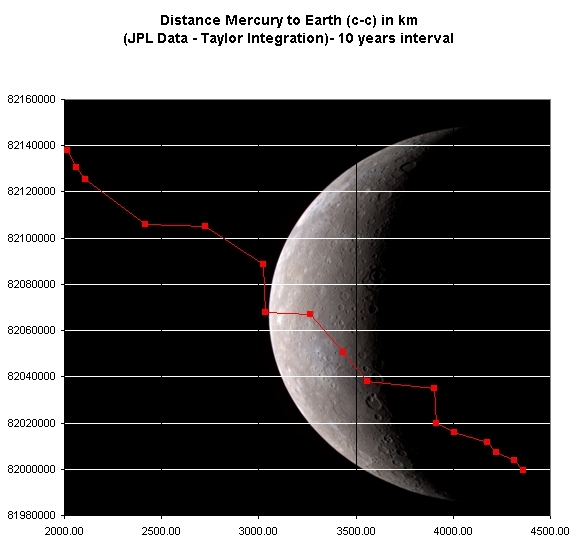 Hereunder a graph of Mercury's distance to Earth which I ran at high accurancy . This result is I think in accordance with the Solex 10 simulation mentionned above . The distance seems to be decreasing with time . 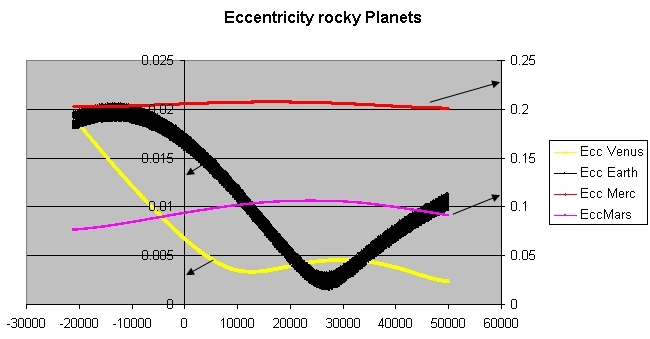 Reasons for this behaviour are variations in the eccentricity of Mercuries orbit , the precession of its orbit , but also the change in inclination ....But also Earths orbit changes in this time period . I'll try to post some additional info about this variations . 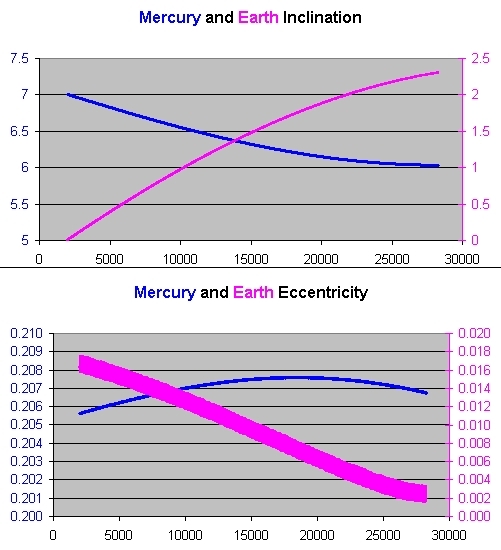 The decreasing distance between Mercury and Earth is partially due to the changing inclination and eccentricity of Mercuries orbit ( see graph below) . But also Earths orbit changes . In this timeperiod the inclination of Earth rises to more than 2°. The orbits seem to be static at first sight , till the animation starts again . 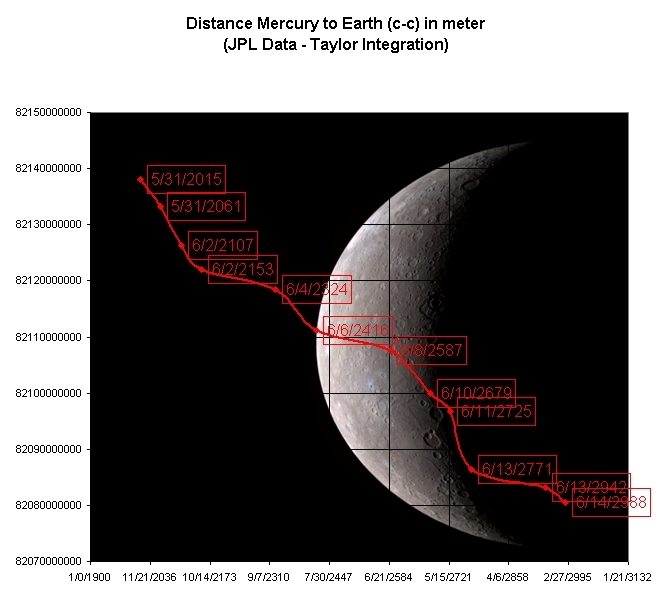 Clearly visible is the precession of the perihelion of Mercury , but also Earth orbit seems to shift upwards. The animation was run over 22000 years . Unfortunately due to downsizing the sun isn't visible anymore in this screenshots . Wow Frank. Those are very nice charts. I am impressed. 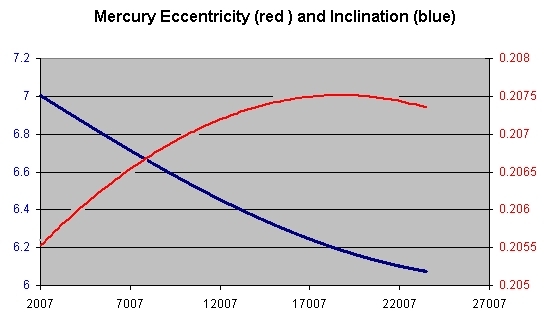 I can really see how Mercury gets closer since the inclination drops as the eccentricity increases. Kevin , as asked hereby the evolution of Earths Inc and Ecc in comparison with Mercurys over a timespan of more than 26000 years . Graph was generated using the Picard Integration . The result should be comparable with the results you get with the Solex10 program . The broad variation in Ecc of Earths orbit is due to our Moon . The result is also availabe in .xls format . 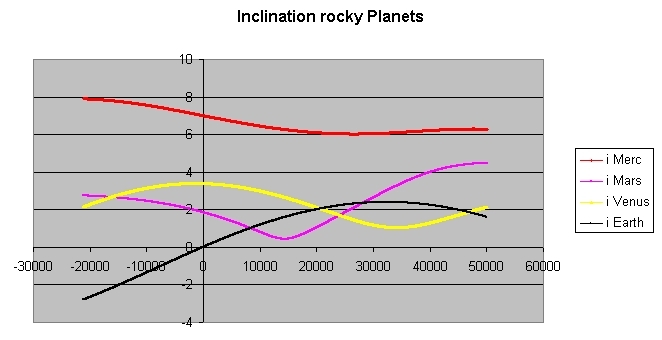 I've extended the above picture to the four rocky planets and extended also the time period (0= now ) . Note: In Franks plots the point 50,000 is the year 52,007 since he set the 0 point as 2007-02-01. It took some time to have the full solar system simulated for a period of 250.000 years from "now" . Inclination reaches a maximum of 10° , while eccentricity is generally decreasing . Something happens around 100.000 years from now for the Sma. Edit : above simulation was run under Newtonian gravity and does not take into account any oblateness . 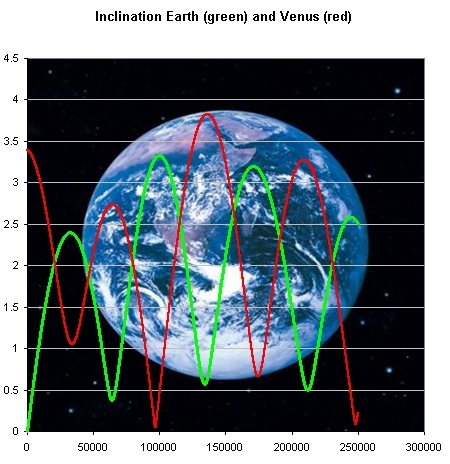 Even more mysterious is the evolution of the orbital parameters of our sister planet Venus . The plot was generated with the full solar system . Earth and Venus are more closely related than I've previously thought .